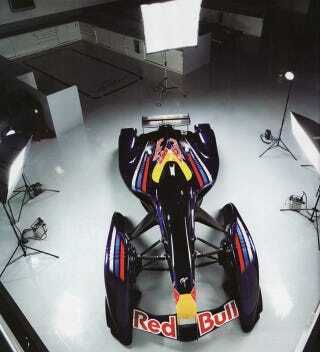 The Red Bull X1, star of the almost-here Gran Turismo 5, now exists in solid form outside of a PlayStation 3. Unfortunately, the no-holds racer's translation to model car reality includes dropping its reported gas turbine for a twin-turbo V6. According to EVO magazine, the X1 will debut in its non-digital state at the European launch of Gran Turismo 5 supposedly set for later this month, with a Formula 1-based V6 good for 1,483 hp. Maybe we'll live long enough to see it actually move on its own power.